St Thomas More's great-great-granddaughter, Helen, left England at the age of seventeen as a key figure in a new venture: the foundation of a monastery for Englishwomen under the aegis of the English Benedictine Congregation. Suitable, though dilapidated, buildings were found in the city of Cambrai. 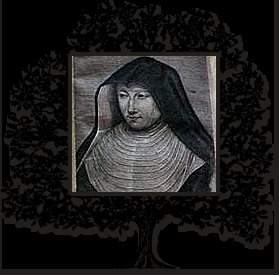 There, together with two of her More cousins and six other young Englishwomen, Helen was clothed in the Benedictine habit on 31 December 1623 and professed as Dame Gertrude on 1 January 1625. The monastery of Our Lady of Consolation, now at Stanbrook Abbey, Wass, had come into being. Dame Gertrude herself was utterly miserable. A lively extrovert, she was not born to a life of prayer and had not particularly wanted to enter a monastery, though she had kept that to herself. She tried to read spiritual books, consult different confessors, but in vain. In November 1625 she was so desperate that she went to the man she had hitherto ridiculed, Father Augustine Baker. Within a fortnight her life was changed. What had seemed impossible was 'made by him so easy, and plain,' she recalled. Once she had learnt to put aside self-will, she was free to recognize God's voice, the 'call' or prompting of the Holy Spirit in her heart. Her fear and despair gone, Dame Gertrude was at last flying 'freely with wings of Divine love'. In 1629 her younger sister Bridget arrived in Cambrai. She never had any doubts about her vocation, but her widowed father had begged her to wait until her brother was safely married. On his wedding day, he had second thoughts and slipped away to tell her, to her horror, that he wanted to be a monk. She eventually persuaded him to return to his bride, and the next day left for Cambrai, where in 1630 she was professed. In 1652 Dame Bridget became the first prioress of the community founded from Cambrai in Paris and now at Colwich Abbey, near Stafford. The two sisters did not have long together. Struck down by a virulent strain of smallpox at the age of twenty-seven, Dame Gertrude died on 17 August 1633, peacefully and fearlessly; for her God had already become all in all. Father Baker edited her private spiritual writings, published in 1658 as The Spiritual Exercises of D. Gertrude More, and added a biography. Dom Benedict Weld-Blundell's The Inner Life and Writings of Dame Gertrude More (2 vols, 1910-11) is a modernized version of both. Ben Wekking's 2005 version drawn from all known sources is the latest and probably definitive. D. Frideswide Sandeman's Dame Gertrude More was re-issued in 1997. D. Gertrude appears in the 'Oxford Dictionary of National Biography'.